Taken in the evening on 30th May 2014 at NGR SM8833335309. 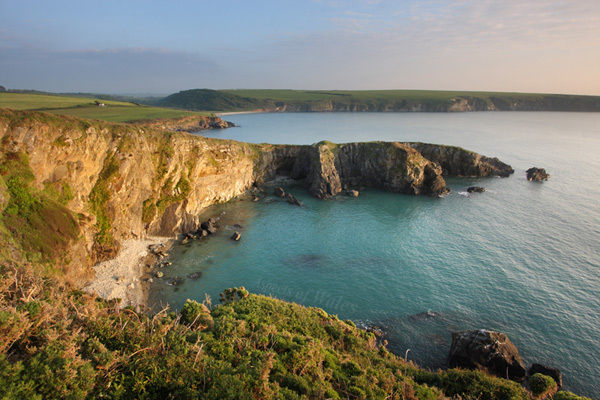 Porth Dwgan is a very small cove on the Pembrokeshire Coast between Aberbach (just around the corner to the south) and Pwllcrochan, which themselves are between St Davids and Fishguard. The beach at Abermawr is visible in the background of this photo, at the mouth of a wooded valley. Canon EOS 40D, Canon EF-S 10-22mm lens at 12mm, Manfrotto tripod. Exposure F11 at 1/15 secs. Original image in Raw format.